That remains our outlook today in our final forecast of the year. Clinton is a 71 percent favorite to win the election according to our polls-only model and a 72 percent favorite according to our polls-plus model. (The models are essentially the same at this point, so they show about the same forecast.) This reflects a meaningful improvement for Clinton in the past 48 hours as the news cycle has taken a final half-twist in her favor. Her chances have increased from about 65 percent. Our forecast has Clinton favored in states and congressional districts totaling 323 electoral votes, including all the states President Obama won in 2012 except Ohio and Iowa, but adding North Carolina. However, because our forecasts are probabilistic, and because Clinton’s leads in North Carolina and Florida especially are tenuous, the average number of electoral votes we forecast for Clinton is 302, which would be equivalent to her winning either Florida or North Carolina but not both. First, Clinton’s overall lead over Trump — while her gains over the past day or two have helped — is still within the range where a fairly ordinary polling error could eliminate it. Third, Clinton’s coalition — which relies increasingly on college-educated whites and Hispanics — is somewhat inefficiently configured for the Electoral College, because these voters are less likely to live in swing states. If the popular vote turns out to be a few percentage points closer than polls project it, Clinton will be an Electoral College underdog. Let me briefly go into detail on each one of these points. Three- or 4-point polling errors should also be familiar from other contexts. Republicans beat their polls by 3 or 4 percentage points, on average, in competitive Senate and gubernatorial races in the 2014 midterms. Brexit was about a 4-point polling error, and the error in the 2015 U.K. general election was larger — Conservatives’ margin over Labour was understated by about 6 percentage points. We often get annoyed when people express shock after outcomes like these occur — polling is a tricky business — only to expect polls to be infallible the next time around. In our national polling average, about 12 percent of voters are either undecided or say they’ll vote for a third-party candidate. While this figure has declined over the past few weeks, it’s still much higher than in recent elections. Just 3 percent of voters were undecided at the end of the 2012 race, for example, according to RealClearPolitics. Clinton’s share of the vote — about 46 percent in national polls — is low for a leading candidate, and Trump’s share of 42 percent is the lowest of any candidate since Bob Dole in 1996. As ought to be fairly intuitive, undecided voters make for a more uncertain outcome. If two-thirds of undecideds were to break for Trump, for instance, the candidates would tie in the popular vote at almost 50-50. If Clinton were to win undecideds by that margin, she’d claim a 7- or 8- point popular vote victory. Granted, these outcomes are not totally realistic, given that the third-party candidates will get at least some votes. But a candidate polling at just 46 percent of the vote can’t take her victory for granted, and one polling at 42 percent is at risk of a blowout if late-deciding voters move against him. Undecided voters contribute significantly to uncertainty in the FiveThirtyEight forecast. If there were half as many undecideds — in line with recent past elections but still more than in 2012 — Clinton’s chances of winning the Electoral College would rise to 78 percent in our forecast, and her chances of winning the popular vote would be 89 percent, higher than Obama’s were in our final 2012 forecast. 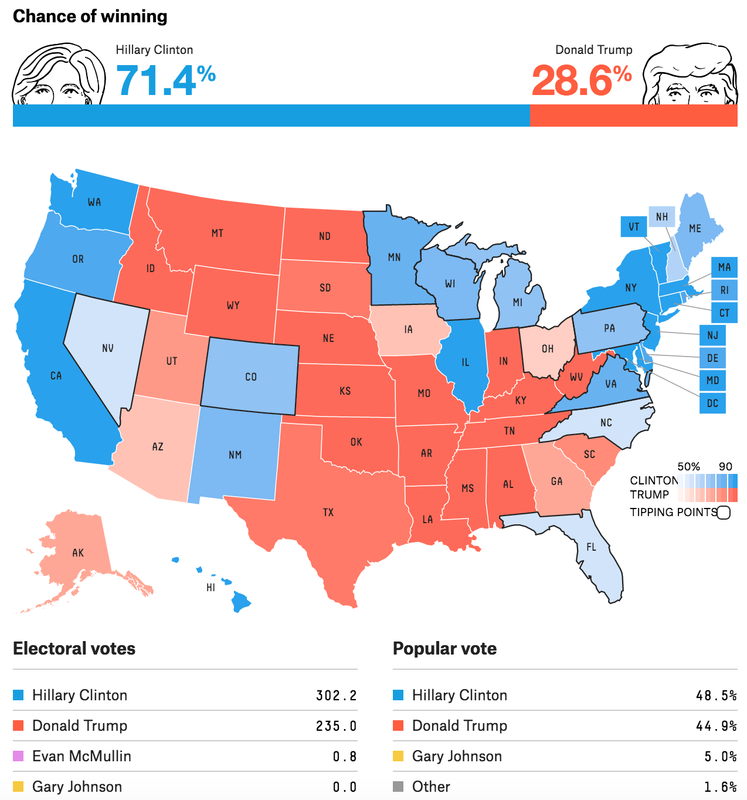 By definition, if Trump or Clinton beat their polls by 3 points nationally, they’ll also do so by 3 points in the average state.2 If anything, in fact, the gain might be larger than that in the average swing state because swing states tend to have more swing voters than non-swing states do. (In FiveThirtyEight parlance, they’re more elastic — more responsive to changes in national trends.) Here, for example, is how our polls-only model shows the swing states lining up if the polls are exactly right, if there’s a 3-point error in Clinton’s favor, or if there’s a 3-point error in Trump’s favor. If there’s a 3-point error in Clinton’s favor, she’d be a heavy favorite to win Florida and North Carolina, and she would probably also flip Ohio, Arizona, Nebraska’s 2nd Congressional District and possibly Iowa to her column. Georgia would be highly competitive. Clinton would probably need a Reagan-in-1980 polling error in her favor — and not a mere ordinary polling error — to put states beyond Georgia in play, although there are some wild cards such as Utah and Alaska that could be competitive. But if there’s a 3-point error against Clinton? That would still leave her with a narrow lead over Trump in the popular vote — by about the margin by which Gore beat Bush in 2000. But New Hampshire, which is currently the tipping-point state, would be exactly tied. Meanwhile, Clinton’s projected margin in Michigan, Pennsylvania and Colorado would shrink to about 1 percentage point, while Trump would be about 2 points ahead in Florida and North Carolina. It’s certainly not impossible that Clinton could win under those circumstances — her turnout operation might come in really handy — but she doesn’t have the Electoral College advantage that Obama did in 2012, when he led in states such as Ohio and Iowa and had larger leads than Clinton does in Michigan and Pennsylvania. In particular, Clinton could be vulnerable to a slump in African-American turnout. Or at least, the average state weighted by that state’s turnout.